I believe one of the biggest emerging trends I’ve seen for packaging, and number four of the five trends I highlighted for the year, is the idea of less is more. I know it is a clichéd statement but it has become a reality for a good reason. Consumers are overwhelmed and continually bombarded with information and choices. It certainly doesn’t stop at the grocery store, the drugstore or any big box store. This creates a great opportunity for brands to help consumers sift through the chaos in packaging. The idea of “less” can be broken down into two approaches. The first is less clutter on the package. This means less type and simple graphics – not an abundance of claims or sell copy. Some examples I found that represent this style are Kiklos Olive Oil and Thrive Life™ Freeze Dried Snackies™. For Kiklos, much thought was put into the design of the label and bottle. The label features a simple line drawing of a cross section of an olive along with the brand, the product name, and the net weight. It is a green and white label; the white representing how Greek farmers paint their olive tree trunks white to protect the olives from the sun. The specially designed bottle allows the olive oil to show through on the bottom because the proof of quality is in the color of the oil, or “seeing is believing” as Kiklos says. 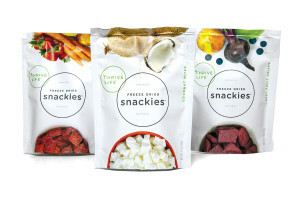 Freezed Dried Snackies by Thrive Life is another example of less on the package. Snackies is a line of premium, natural freeze dried fruits and vegetables. The product form and name is front and center surrounded by the simple type treatment of product flavor and photography of what’s inside. The photography captures the fruits and vegetables in raw form on the top and in freeze-dried form on the bottom half of the package. The second approach to less is more is a straightforward design using fewer colors and simpler fonts. Sometimes brands have new product information that needs to be shared with the consumer but the design doesn’t have to get complex. Two examples I found are Hellmann’s Carefully Crafted Dressing and Sandwich Spread and Naked Pressed. 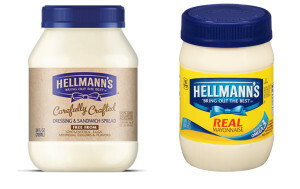 Hellmann’s recently launched a new item called Carefully Crafted Dressing and Sandwich Spread. The product is free from cholesterol, eggs, and artificial colors and flavors. To best represent the crafted nature of the product, they simplified the overall design of the label to a couple of colors, using a one-color logo and muted browns, and simpler imagery versus the traditional ribbons. With this design, the Carefully Crafted stands out on the label. Naked Pressed is another example I found that exemplifies simplicity. 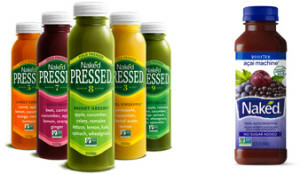 Naked has recently launched their Pressed line, featuring juices that are made through the cold-pressed process. The design features the product name front and center, and below it calls out the amount of veggies and fruits within. While Naked typically features a photo of the fruits and veggies, this new product line has streamlined the design through the use of type, and features labels in colors similar to the juice. The ability for brands to simplify the design of their labels isn’t always easy. Given the information overload consumers are experiencing, it may be something they want to consider. Help consumers find your brand and learn more about your products through simple design or the less is more approach. We can help. Learn more about our consumer packaging expertise.